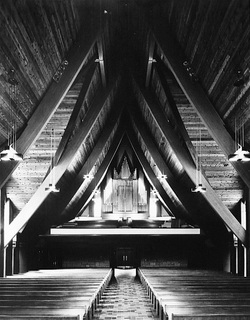 The website of the organ building firm Randall Dyer & Associates, Inc. tells an interesting brief history of the Moeller Artiste organ, an example of which is found at First Lutheran Church. The Artiste was the Moeller Company's answer to an organ at lower cost. 80' organs, so named for the decade in which they were built. The organ was revoiced by Dan Abrahamson of the Reuter Organ Company in the 1990s. A Cymbelstern has also been added.